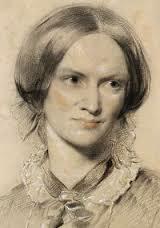 On 24-26 April the Brussels Brontë Group held a Brontë weekend of events for the third consecutive year. The programme this year was ambitious, with musical settings of Emily Brontë's poems, talks by the writer Stevie Davies and by a Brussels-based academic, Philip Riley, and the guided walk which has become a fixture at these weekends. 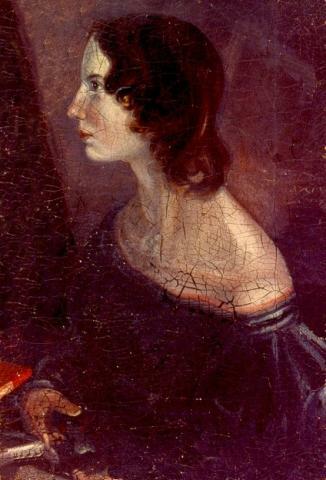 We have been focusing on Emily this year, starting with a talk on Wuthering Heights last October, and this weekend was no exception. It kicked off with a concert by Veronica Metz from the Celtic band Anois, who will be performing at the AGM weekend in Haworth. She sang her musical settings of Emily's poems for us, with introductory comments by Maureen Peeck. Stevie Davies travelled all the way from Wales to talk to us about Emily Brontë and the Mother World and introduce us to some of the ideas explored in her book Emily Brontë: Heretic. Listening to Stevie is as stimulating and exciting as reading her books, and she held us spellbound. There was an interesting discussion afterwards, with thoughtful contributions from our members (of all ages and nationalities) prompting further insights from Stevie. In the afternoon we enjoyed a very different kind of talk by Philip Riley, professor of sociolinguistics, onThe Brontës' strong language. Philip's lively talk was wide-ranging and fascinating, packed with information on the social as well as linguistic background to the Brontës' works. He had the idea of giving a talk on the Brontës after joining our newly-formed group shortly after he retired to Brussels. Once again, our events were hosted by a Brussels university, Facultés universitaires Saint-Louis, whose staff made us extremely welcome as always. We discussed with them various ideas for joint projects the Brussels group could carry out with the university's English department. 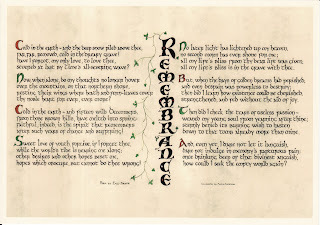 Our member Marina Saegerman's calligraphy versions of Brontë poems were in evidence at the events, displayed in the lecture room and framed as presents for our speakers and singer. Sadly, it rained throughout our guided walk on Sunday morning, but our guide Derek Blyth gave a valiant performance despite the weather and other hazards such as the scaffolding everywhere owing to ongoing renovation and building work, including on the building now on the site of the Pensionnat Heger. The rain meant that a planned picnic in the park described in Villette had to be called off. Luckily the weather had been fine on Friday for the trip led by Eric Ruijssenaars to a Brussels cemetery to search for the graves of Martha Taylor and Julia Wheelwright. After the walk a group of us rounded off the weekend by discussing plans for the future over lunch at our regular place, the well-known A La Mort Subite, named after a Belgian beer. Despite its name, this venue has in fact seen the birth of many ideas for Brontë activities in Brussels. A more detailed account of the talks by our two speakers will be posted shortly. It can be useful to search occasionally for the Rue d’Isabelle on the internet. Last time I did I found these two old, undated, postcards of the street. The photographs are well known but to see them as a postcard is really interesting. These postcards are presumably older than the one I wrote about recently here. That ‘Vieux-Bruxelles’ referred to something at the 1935 World Exhibition, which was portrayed as Old Brussels, but from a historical point of view it was totally uninteresting. They had created a little quarter with about eight streets. Only the names of the streets were related to the actual old Brussels. 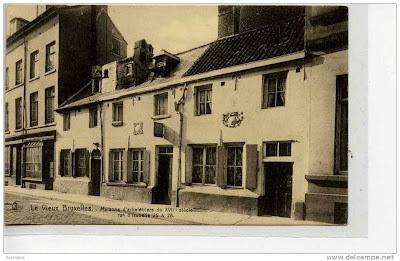 These two postcards seem to relate to the time of the Comité d’Etudes du Vieux-Bruxelles, which was founded in 1904. Its main aim was to take photographs of the threatened parts of Brussels, such as the Isabella Quarter. This collection of some 1,500 pictures is of course extremely valuable. For example, it contains these two pictures. This Vieux-Bruxelles, a term already used a decade earlier, was essentially a nostalgic euphemism for what had already been lost in the last decades and what was about to disappear. But this period did produce a lot of important work. With the outbreak of the First World War the interest in Vieux-Bruxelles ended, and afterwards the term was hardly used any more. 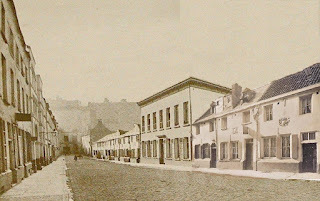 The first photograph shows you the three remaining 17th century houses of the then important guild of crossbowmen, who laid the foundation of the Pensionnat‘s large garden. 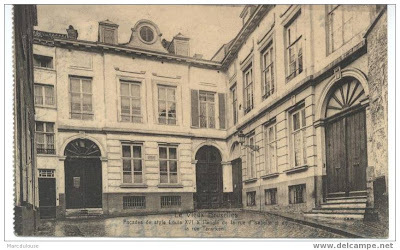 The second photograph shows us the corner of Rue Terarken and Rue d’Isabelle. If you go just around the corner you will be in the Rue d’Isabelle. Unfortunately this will never happen. This picture I have always found fascinating. Perhaps most for what is not in it, i.e. what is just around the corner. In what remains of the Rue Terarken you are not far away from that corner.